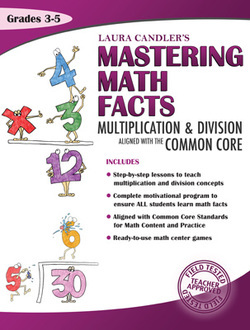 Laura Candler’s Mastering Math Facts – Multiplication & Division: Aligned with the Common Core is a proven method for helping students achieve 100 percent mastery of multiplication and division math facts. ​Whether you teach third, fourth, or fifth grade, you will find Mastering Math Facts – Multiplication & Division the best method to use for teaching the topic from the beginning and reinforcing struggling students. Everything you need is included in the book—reproducibles, patterns, activity sheets, games, and assessment materials.